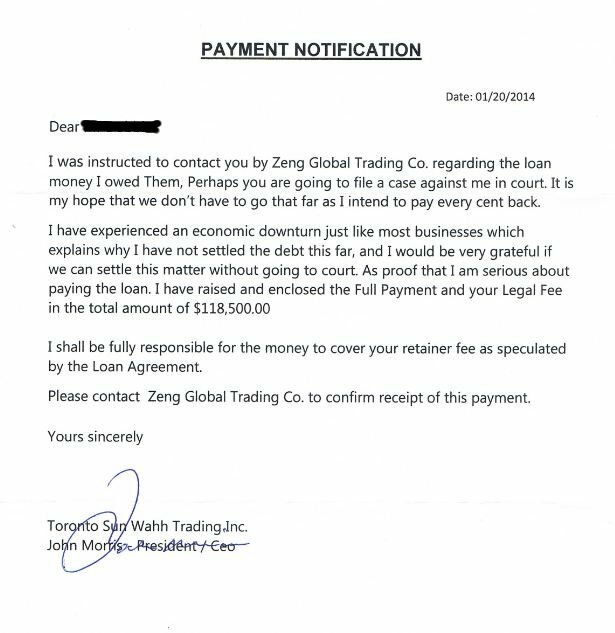 An Ontario lawyer informed us that he was contacted by a Zeng Chen looking to retain him to collect on a loan. While it quickly became apparent that it was the usual bad-cheque fraud attempt, what is different in this case is that the fraudster called the lawyer, rather than initiate contact by email. He followed up with other calls and emails as the matter progressed. At first this lent the matter some legitimacy, but eventually several red flags appeared: signing a retainer but not actually paying it, the debtor agreeing to pay even before the lawyer did anything, and claiming to get the lawyers name by an unknown referral. Here are some of the emails the lawyer received, as well as scans of the fake cheque and cover letter from the “debtor”. Thanks for your immediate respond. here is a signed copy of the retainer. Note – the Debtor Mr Morris call my secretary yesterday after he was aware that my lawyer is in charge of this matter now. that has scared him Alot. and he has call me more than 7 times. so i told him that if he does not want this matter to go to the court he has to PAY the full Balance of what he owe’s me plus any additional fee for my Lawyer. he has Already Accept to Pay All the Funds to you by nest Week. my secretary has given him your information to contact you Direct not us. he said he will be sending $118,500.00 that will Include both the Total balance plus your Retainer Fee. i will forward any additional information later today. The Law Office of XXXXXXXXXXXXX. which was done today by my Bank Officer Ms Monica Piers. we do not want this matter to get to the court. we do apologize for any inconvenient. Note. 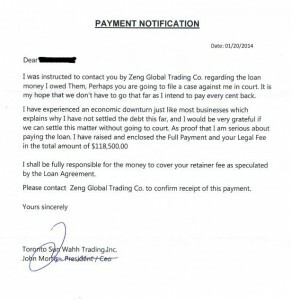 Please NOTIFY Zeng Global Trading.